Research consistently finds that listening to music distracts athletes from their “bodily awareness”. And a recent study found that not just listening, but controlling and creating music in time to one’s pace had an even more profound effect on perceived effort during a workout. Here are seven very good reasons to rock out during your next gym session. 1. Music is the good kind of distraction. While the study did suggest there’s more to it than distraction, working out with music did make participants less aware of their exertion. Such a distraction can benefit athletic performance by up to 15 percent, The Guardian reported. The faster the better, according to WebMD: Upbeat tunes have more information for our brains to process, which takes your mind off of that side stitch. 2. It ups your effort. A 2010 study found that cyclists actually worked harder when listening to faster music as compared to music at a slower tempo. But too fast is no good, either. Songs between 120 and 140 beats per minute (bpm) have the maximum effect on moderate exercisers. 3. Music puts you “in the zone”. Everyone has that go-to song that gets you “in the zone,” and there’s science to why it works. We associate certain songs with memories, often relating to the context in which we originally heard them, such as the first time you watched Rocky. Channeling that memory — or even just the emotion of the singer — boosts the motivational power of the song, and has been shown to improve physical performance. 4. A good beat can help you keep pace. 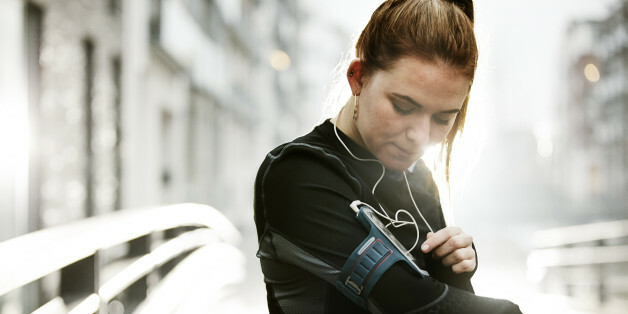 The rhythm of your workout music stimulates the motor area of the brain as to when to move, thereby aiding self-paced exercises such as running or weight-lifting. Clueing into these time signals helps us use our energy more efficiently, since keeping a steady pace is easier on our bodies than fluctuating throughout a sweat session. 5. Music can elevate your mood. An August 2013 analysis found that people often listen to music as a way to change their mood and find self-awareness. Study participants said that listening to music allowed them to think about themselves, who they wanted to be and give them an escape from the present. No matter what happened an hour ago, you can use your tunes to help you escape negativity and power you through your workout — and you know you’ll feel great when it’s over. 6. It makes you want to move. You really can’t stop the beat! Researchers found that when music possesses “high-groove” qualities, the brain gets excited and induces movement in the listener. Basically, your playlist has the ability to make you move — no matter how much you’re dreading that workout. 7. Listen to music already? Take it to the next level: Making music while you work has an important added benefit. According to a study published earlier this month, the relationship between music and physical exertion may be more complicated than we initially thought. It isn’t just listening to music that drowns out our pain and exhaustion, asserts lead researcher Tom Fritz. The process of creating and controlling music in time to one’s exercise improves the experience even more. Participants exercised on machines designed to alter the music they were listening to based on their movements, essentially allowing them to create their own soundtrack. Compared to exercisers who had no control over the music, those with “musical agency” reported feeling like they hadn’t worked as hard.